The medical team not only provides care, but also pre-screens candidates and schedules the surgical rotation, provides post-surgery care and training for follow up with local providers. 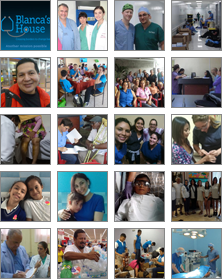 Blanca`s House doctors, surgeons, physician assistants, nurse practitioners, CRNAs, OR, pre-op and PACU nurses and surgical techs of varying specialties are recruited to match up with the host country`s particular medical needs at a specific site. Medical practitioners can volunteer for any trip and will be matched for a mission based on their area of expertise as well as where they are needed most while gaining a global health perspective. Be supervised by practicing Health Care Providers in their specialty. Be exposed to social and cultural issues more intensely than they would ever experience at home. We take care of problems caused by poverty, malnutrition, inadequate immunizations, inadequate health care systems, illiteracy, and inadequate sanitation in a culturally sensitive way. Be exposed to many disease entities that are uncommon in the United States and many that are in more advanced stages than would be expected in a first world country. Whether we provide patients with their first dental experience or a returning patient needing additional restorative treatment, we are providing unparalleled dental care for people who would otherwise have limited or no access to a dentist. By providing dental screenings, on-site surgeries, and educational outreach, provides twenty-first century dentistry to the underprivileged living in remote communities throughout Ecuador. All our team members are volunteers, paying for their own travel expenses and donating their time and expertise for every mission. Blancas House facilitates the logistics of the mission trip as well as, organizes and transports donated dental equipment and supplies to the communities we serve. Thank you for your interest in joining one of Blanca’s House’s missions. In order to apply for a mission, you must first register with us. Once your registration is completed and approved by a coordinator, one of the Executive Directors will contact you with next steps. DISCLAIMER:Blanca’s House is not responsible for any change(s) to the location of a medical mission due to the host government’s decision to relocate the site of delivery of medical services based on their review of need. Please complete our registration form. Upon completion, you will be contacted by one of our coordinators. Please do not complete this form at a hospital, university or medical facility due to security firewalls that may prevent the completed form from being received. Once you are registered and approved by one of our coordinators, you will be given a username and password. You will need these to apply for a specific mission. Please do not complete this form at a hospital, university or medical facility due to security firewalls that may prevent the completed form from being received. * Once you have submitted your application along with the partial payment, you may complete a fundraising page. Please notify vsimpson@blancashouse.com when your request is submitted.